The Canon RS60-E3 remote control, used on Canon EOS cameras, is a two positional switch just like the shutter release on the Canon EOS camera series. Pushing the button down half way causes the camera to focus, while pushing the button down all the way causes the camera to release its shutter. The wired remote control transmits the signal though a standard 2.5 mm (sub-mini) audio head. The contacts on the head are numbered in the picture below. When the button on the remote control is pushed half way, contact section 1 and 2 are shorted together, causing the camera to focus. When the button on the remote control is pushed all the way, all three contact sections are shorted together, causing the camera shutter to be released. 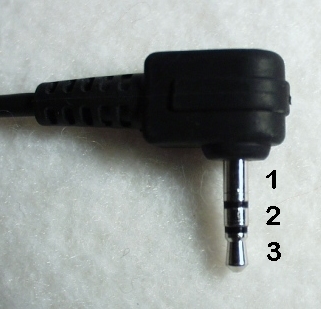 Pin 1 is actually the ground connector. Therefore, it's pin 1 and pin 3 that causes the camera to trigger. Build your own remote for your Canon 300d (Digital Rebel) camera!